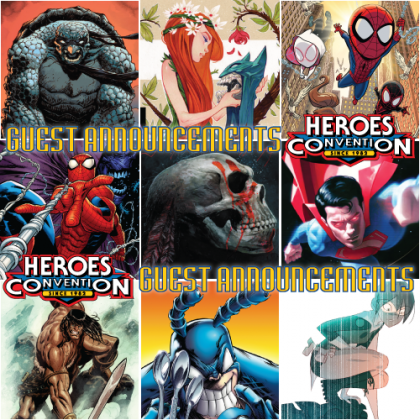 Guest Announcements – Round FOUR! Heroes is happy to announce our FOURTH wave of Featured Guests for our 2019 Convention! Start making your “must-see” list NOW! Lots of artists start their commission lists well in advance of the convention, so be sure to check their websites and social media! 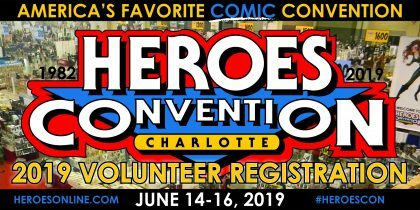 Keep an eye of the Heroes Hotline, Facebook, Instagram and Twitter as we continue to add more great artist to our 2019 Guest List, and get your 3-DAY ADVANCE TICKETS TODAY!! In honor of Labor Day, we’ll be hosting a two day sale next weekend! It kicks off on Sunday, August 31 from 10 a.m. until 6 p.m., then picks back up on Monday, September 1 from 10 a.m. until 6 p.m. Note that we’ll be opening three hours early next Sunday to start the festivities and give you all a few extra hours to shop. What will be included in this sale? 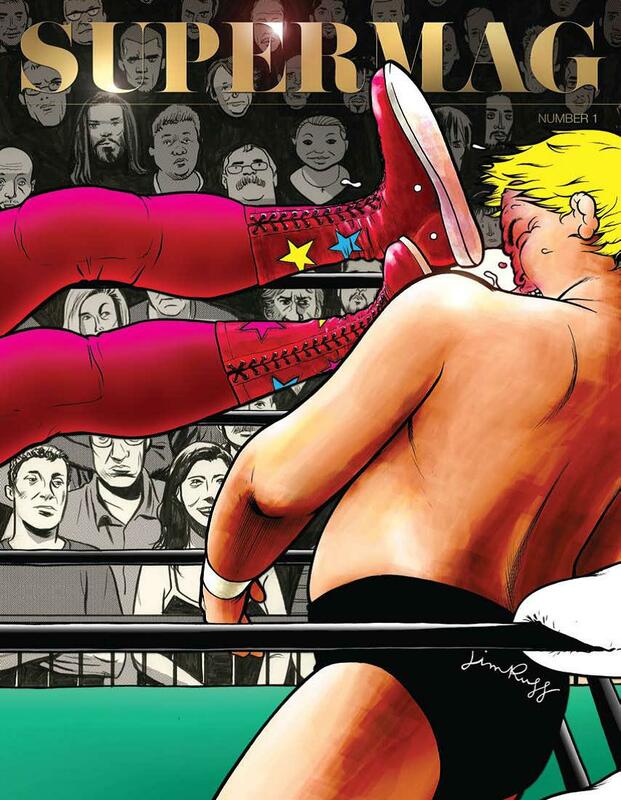 To start, we’ll have 30 long boxes of a brand new dollar comics on hand. This stock has never been displayed at a Heroes event, nor has it been on the road at any of our numerous convention appearances. We’ve been saving these especially for this event, so know that you’ll have plenty of good dollar comics to find. If that’s not enough, Shelton has declared that every statue in the store will be on sale, all priced to move! It’s rare that our entire stock of statues will be on sale, so if you’ve had your eye on any of them, next weekend will be the perfect time to pick them up. It’s going to be a busy Fall at Heroes, and we’ll have some exciting announcements in the coming weeks about store signings and our annual Heroes Pop Swap. Stay tuned to this very blog for all the news, and we’ll look forward to seeing you next weekend. Sunday, August 31: 10 a.m. – 6 p.m.
Monday, September 1: 10 a.m. – 6 p.m. Sometimes it takes two men to do the job of one woman. Starting this month, Seth and Rico team up to tackle April’s telephone book-sized edition of Previews and let you know what grabbed their attention. Of course you can also get your very own copy at the store, flip through every page and let us know what we slept on. What’s good Seth? Seth Peagler (SP): The first thing that caught my eye when I opened April’s Previews was ABE SAPIEN: DARK AND TERRIBLE #1 (of 3) (p. 42). 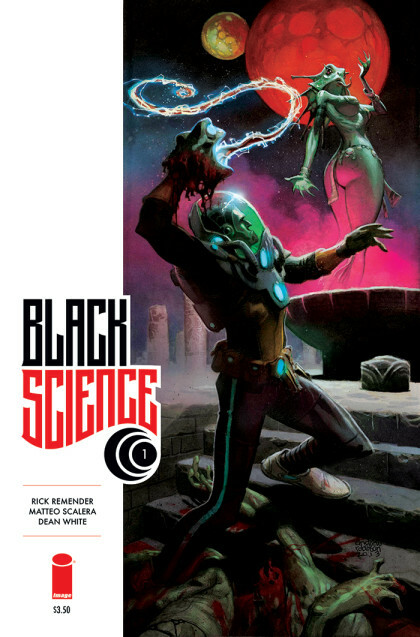 Regular readers of the Heroes Blog know I’m a huge fan of the Mignolaverse, but this new miniseries offers a good jumping-on point for new readers. Not only does it feature adventures of Abe Sapien in his new and further mutated form, but it finally kicks off a series of miniseries that will deal with everyone’s favorite fish-man. Turning over to DC, what jumped out at you? Rico Renzi (RR): SOLO (hardcover p. 138) was one of those rare occasions where a big company with beloved characters turned some of comics’ best cartoonists loose on their marquee characters free of the shackles of continuity. SP: True. I remember this being significant for that reason, but also for the variety of genres that were included. You’ve got artists like Darwyn Cooke, Mike Allred, Tim Sale, Richard Corben, Paul Pope and more telling the exact stories they want to tell. 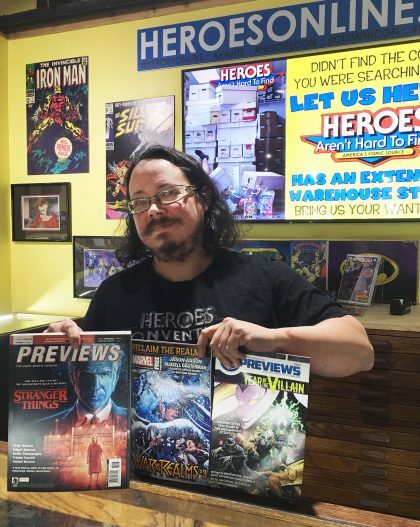 There’s everything from superheroes, to westerns, horror and everything in between. RR: There’s also a new Dustin Nguyen book, BATMAN: LI’L GOTHAM #1 (p. 143). 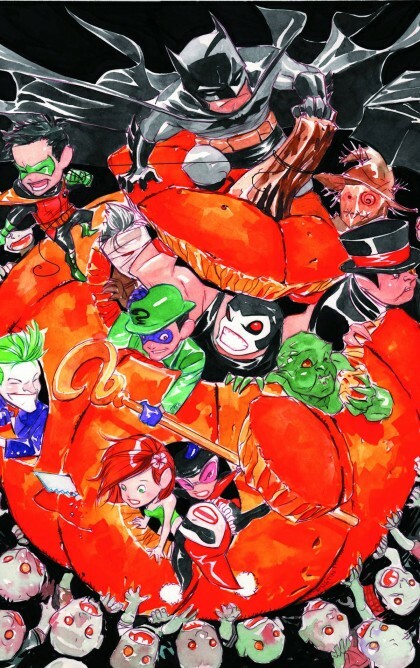 Nguyen has taken his hobby of drawing the residents of Gotham in adorable kid form (like Arthur Adams did with the X-Men in the 80’s) and turned it into a new series for DC. SP: I read some of these stories when they were digital-only releases, and they definitely appeal to fans of all ages books. Also, if you like Skottie Young’s baby variants on the recent Marvel Now relaunches, I’m betting you’ll dig Nguyen’s take on these Bat tykes. RR: Over at IDW, I noticed their new book COLONIZED (p. 169). Drew Moss, an artist a lot of local fans met at the recent Charlotte MiniCon, is drawing Chris Ryall’s new book. 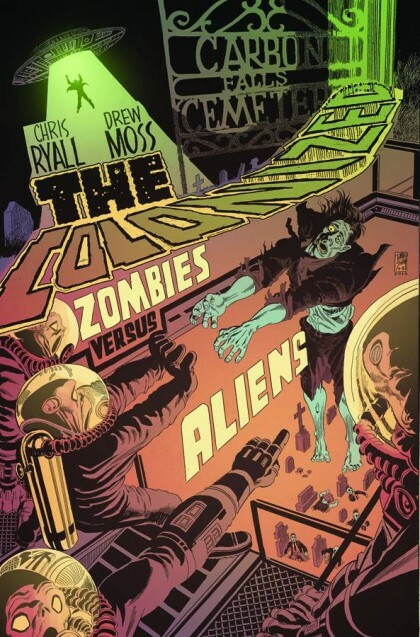 It’s Zombies vs Aliens wrapped in beautiful Dave Sim covers. SP: Also from IDW in April is a the collection of a book whose single issues we couldn’t keep on the shelves: James Stokoe’s Godzilla: The Half Century War (p. 170). RR: Stokoe’s art blows my mind, man. Godzilla hasn’t looked this good in a long, long time. RR: Image’s solicited cover of JUPITER’S LEGACY (p. 188) would have you believe it’s the gripping tale of love between Russell Brand and Royal Tenenbaums-era Gwenyth Paltrow but that can’t be right can it? SP: Alas, we may never know. What we do know, however, is that Jupiter’s Legacy is the new, highly anticipated Image title from Mark Millar and Frank Quitely. 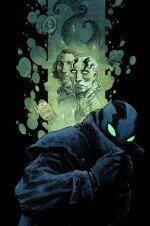 Also new from Image is a new book from Steve Niles and Tony Harris, CHIN MUSIC (p. 192). It looks like it sets supernatural elements against a gangster backdrop. 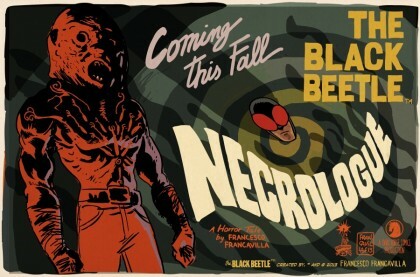 RR: If you don’t like your comics all dark and heavy, some beloved characters are getting their own comic this April. 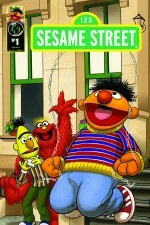 The gang from SESAME STREET (p. 244) is being drawn into their very own comic series illustrated by a HeroesCon-favorite guest, Amy Mebberson . Whether you’re looking for something for your kids to read or you’re just a Street fan from way back, check this one out. SP: April also sees an original ADVENTURE TIME graphic novel (p. 277) by Danielle Corsetto. In addition to being a new story, it’s printed in a pocket black and format, similar to Scott Pilgrim. 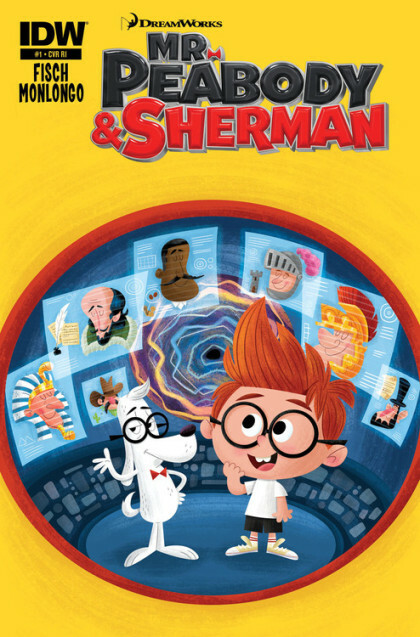 RR: Another hugely popular cartoon is finally getting the comic book treatment in April. 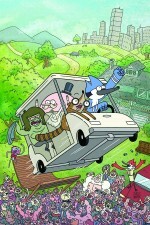 Writer KC Green and artist Allison Strejlau will try to bring REGULAR SHOW’s (p. 279) absurd brand of comedy to the printed page. This is brought to you by the same company that successfully translated Adventure Time to comics, so I’m pretty confident that this one will be good too. RR: Eating is my favorite. Comics and cooking make so much sense together that I’m surprised there aren’t more food/cooking comics. 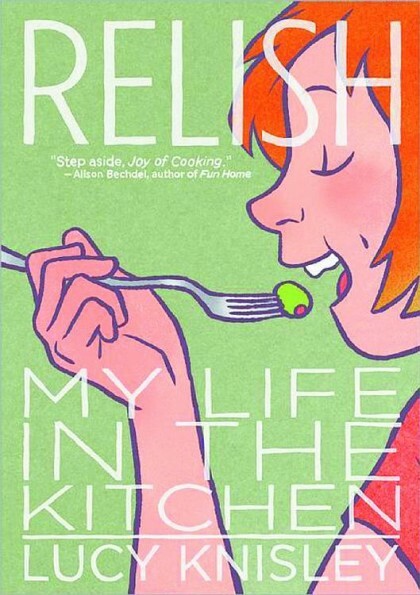 I can’t wait to read RELISH: MY LIFE IN THE KITCHEN (p. 311)… and try out some of the recipes included! SP: Also on the Indie side of April, there are two new books from Dash Shaw. If you enjoyed his excellent Bottomless Belly Button, April gives you a chance to read NEW SCHOOL (p. 312), his latest graphic novel, and 3 NEW STORIES, (also p. 312) which debuts in single-comic format. RR: Dave Elliot is what I’d call a GWT (Guy With Taste). When he puts something new together I will usually check it out on the merits of his great taste in art. 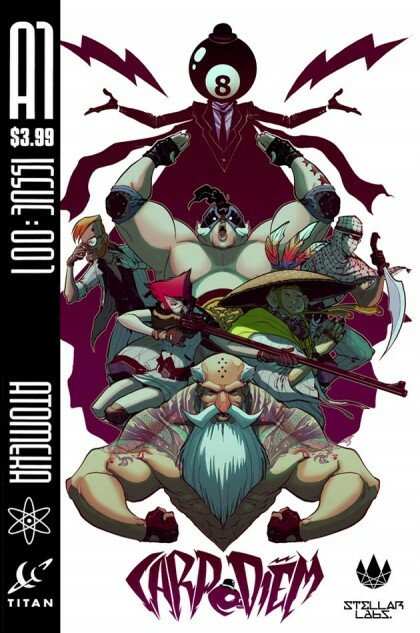 Dave is bringing his anthology A1 #1 (p. 333) back for a 6 issue run at Titan Comics. 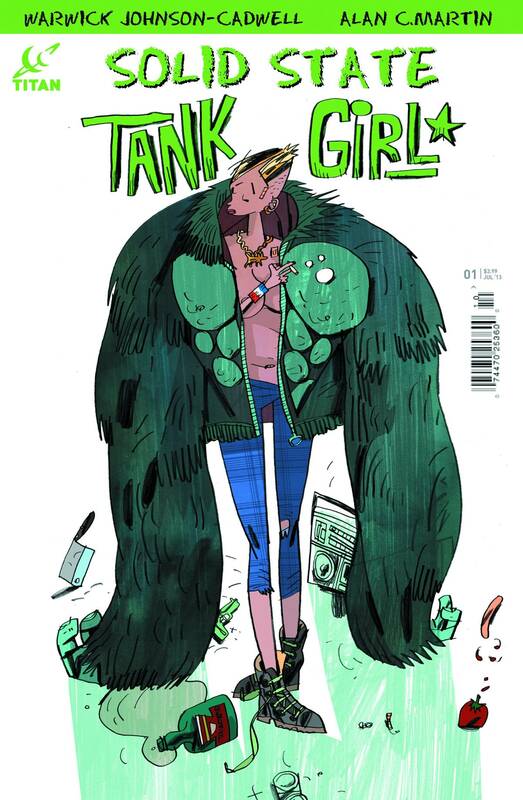 RR: Recently, original Tank Girl writer Alan Martin put out an open call for artists interested in illustrating his new Tank Girl book, SOLID STATE TANK GIRL (p. 333). Warwick J. Caldwell is the artist Martin selected and his art is pretty interesting. It’s worth a look. SP: Some of you might be familiar with Double Barrel. It was a digital effort from Zander Cannon and Kevin Cannon and was comprised of two separate stories, CRATER XV and HECK (both on p. 336). In April, Top Shelf debuts the printed hardcovers of both of these stories, available in print for the first time. 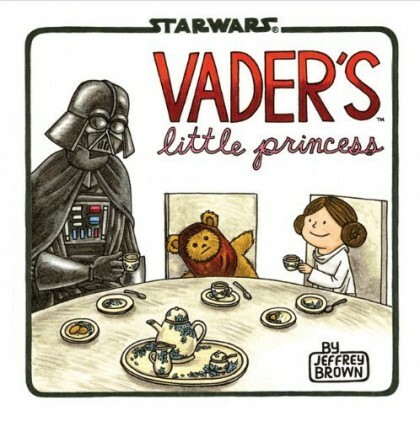 RR: Last year Jeffrey Brown made the hilarious Star Wars: Vader and Son and now he’s following it up with STAR WARS: VADER’S LITTLE PRINCESS (p. 373). It’s like the nerdiest version of Family Circus you can imagine. SP: This is one you’ll want to be sure request in your Previews order. Like Brown’s first Star Wars book, this one should move quickly. 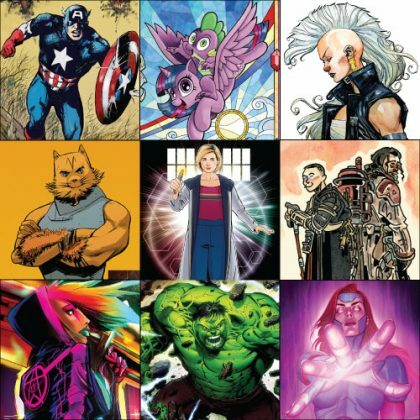 SP: Marvel also has a few new books worth checking out in April. The big one that caught my eye is THANOS RISING. I’m not crazy about Simone Bianchi‘s art, but the fact that Jason Aaron is writing this Thanos miniseries makes it well worth a look. 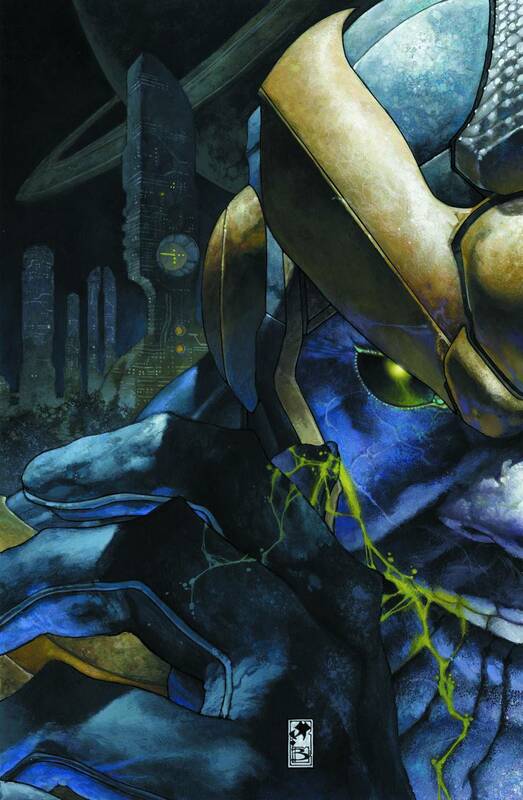 You know Marvel has big plans for Thanos, and this miniseries will probably be the place where those plans begin to unfold. Also in April, Marvel offers up its most ironic title to date: Brian Wood and Olivier Coipel‘s X- MEN#1, which is comprised of an all female team. 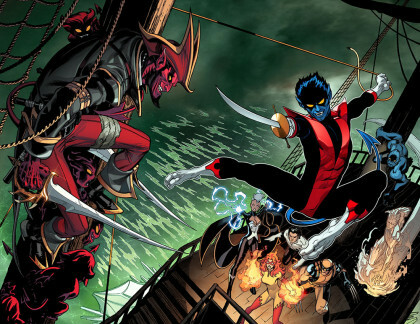 RR: If Marvel can keep Wood and Copiel together on X-Men with this cast of beloved characters, this book will be huge. 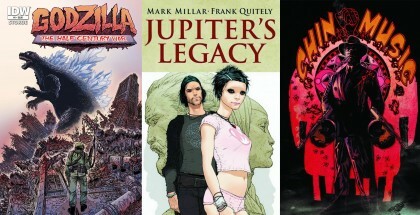 SP: These are some of the books in the new issue of Previews that caught our attention. Be sure to look through a copy for yourselves, and get your special order requests in to the store by February 18.